MAKE THE MARINADE: In a bowl, whisk the fish sauce with the lime juice, sugar, garlic, chiles and salt. Put the chicken in a resealable plastic bag with all but 1/4 cup of the marinade. Reserve the remaining marinade for the Vietnamese Chicken Salad (recipe follows). Seal the bag and refrigerate the chicken for 3 hours. PICKLE THE VEGETABLES: In a small saucepan, bring the water, vinegar, sugar, salt and crushed red pepper to a boil. Transfer the brine to a large bowl and let cool to room temperature. 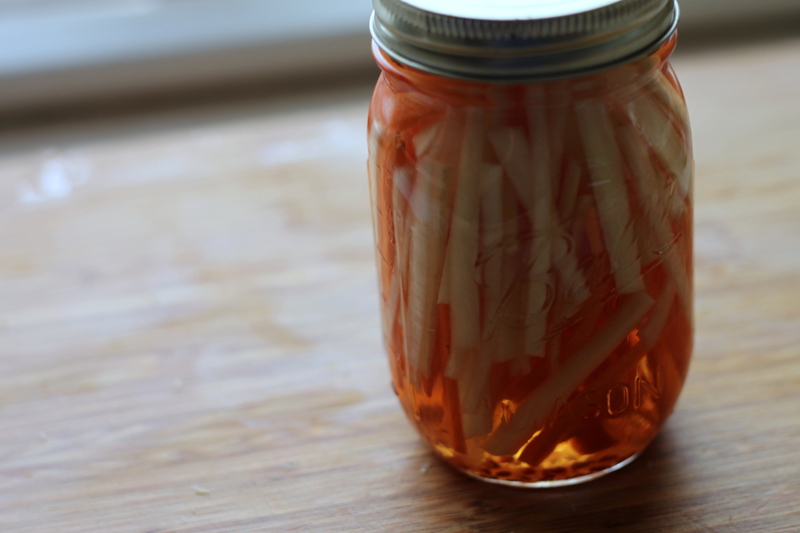 Add the carrots and daikon and cover to keep them submerged. Refrigerate the vegetables for at least 30 minutes and up to 3 days. 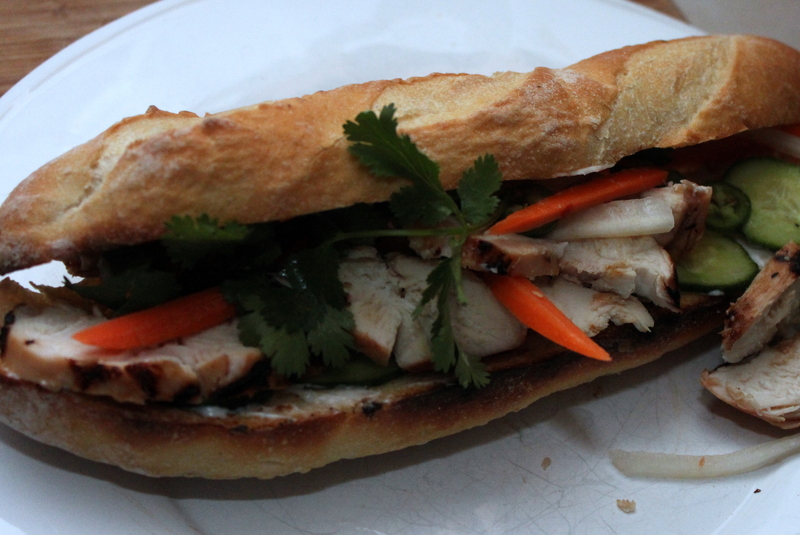 MAKE THE BANH MI: Light a grill. Remove the chicken from the marinade and pat dry. 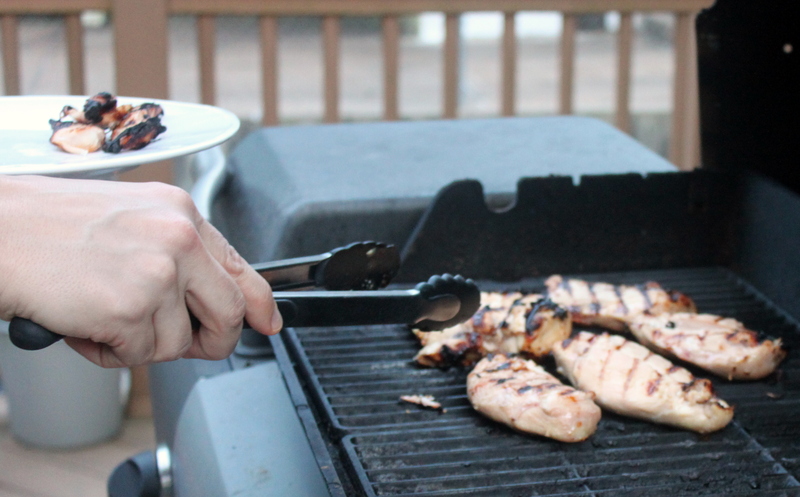 Grill the chicken over moderate heat, turning once, until just cooked through, about 14 minutes. Transfer to a work surface and let rest for 5 minutes.Drain 1 cup of the pickled vegetables. Slice 6 of the chicken breasts. Reserve the remaining pickled vegetables and 2 breasts for the Vietnamese Chicken Salad. Spread the cut sides of the baguettes with mayonnaise. Arrange the cucumber slices on the bottom halves. Top with the chicken and the pickled carrots and daikon. Garnish with the cilantro sprigs and jalapeño. Close the sandwiches and serve. In a large bowl, whisk the reserved chicken marinade with the vegetable oil. Add the cabbage, chicken, shallot, pickled carrots and daikon and chopped mint and cilantro and toss well. Season with salt and pepper.